It took quite some time, because the last Macabre Demise-album, Stench Of Death, was released in 2011. But now the German grind-head behind this project, Andreas Rieger, returns with another extreme effort, Homicidal Parasites, which has a total running time of twenty six minutes. The stuff was recorded by the sole member, Andreas (vocals, strings and drum computer programming), and believe it or not, but mix and mastering were done in Venezuela (Abhorrent Technology Productions). I’d like to start with the artwork, especially the cover painting: isn’t it sweet, tasty, tasteful? And indeed, the sonic expression is exactly the aural translation of this visual art! Yeah, expect no integer elegies or sorrowful church hymns, because what you see indeed is what you get! 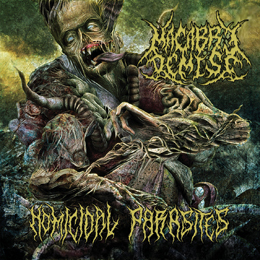 Homicidal Parasites is the rusty nail in between your eyes as from the first riff of the opening title track. It is an album based on quite technical and pounding Death Metal hymns with hints of timeless Grindcore, Old School USDM, deadly Thrash Metal and European Traditional Death Metal. quite remarkable is, I think, that, despite originating from Germany, Macabre Demise takes its influences from the North American, English, Spanish, Dutch and Swedish scenes especially. The average quality of most songs is all right, but I have some remarks: the lack of originality and the lack of variation. When it comes to the first, well, that usually isn’t such a problem. However, in combination with too little diversification and the lack of memorable pieces, it might disappoint the listener, the fan of the genre. It is way too catchy, too clinically clean, too mathematically correct, and therefore it lacks of that specific stinking-fart-in-your-face-mentality that this kind of material might need to show its ugly face. But that’s like the sword that cuts from both sides: some die-hard Grindeath-freaks will spit on this material, but at the other hand, this album might open doors to a new generation of future ‘fans’ because of the accessibility of this stuff. But it does not matter, because seen from a mostly objective point of view, this album is a fine-tuned definition of how Grinding death Metal should sound like in its embryonal stadium. Nothing more, nothing less.